Family Fun In The Dirt. Remember back in the good old days, when bikes were light, simple, affordable, and most of all fun? Honda made some of the best bikes ever, machines that put a whole generation of riders on two wheels, and kept them there their whole lives. Well, guess what? 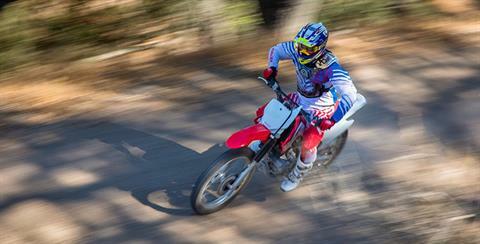 Honda still makes bikes like that, and our CRF230F is a perfect example. Just hop on, push the electric starter, and have a blast. 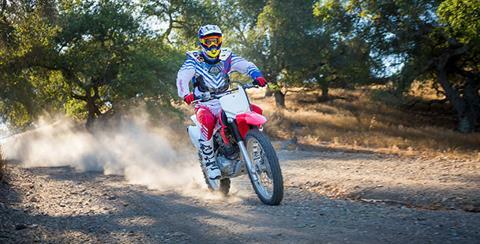 Because it’s a Honda four-stroke, you don’t have to worry about excessive maintenance. With its overall size, sturdy frame and lightweight components, the CRF230F is just the right size for adults or larger teens who can’t wait to take on the twists and turns of the trail. 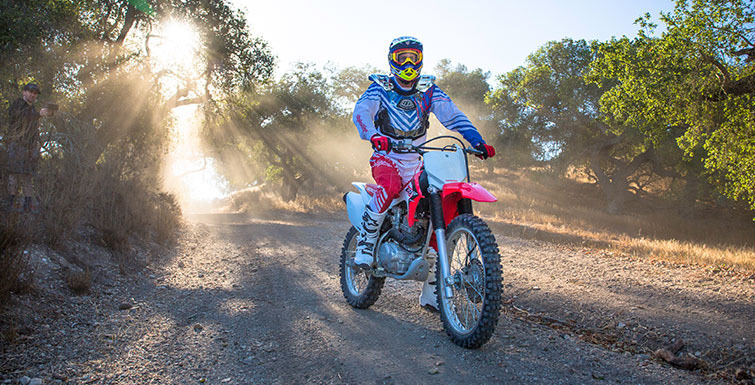 So for anyone who remembers the good old days, here’s a news flash: With a bike like the Honda CRF230F, today is even better than the old days ever were. 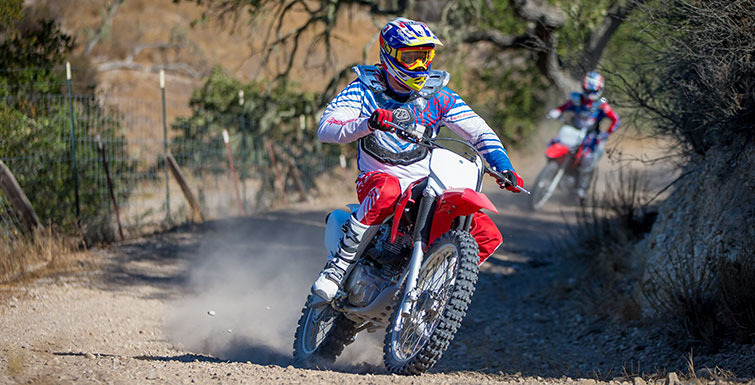 Meets current California Air Resources Board (CARB) and EPA off-road emissions standards. 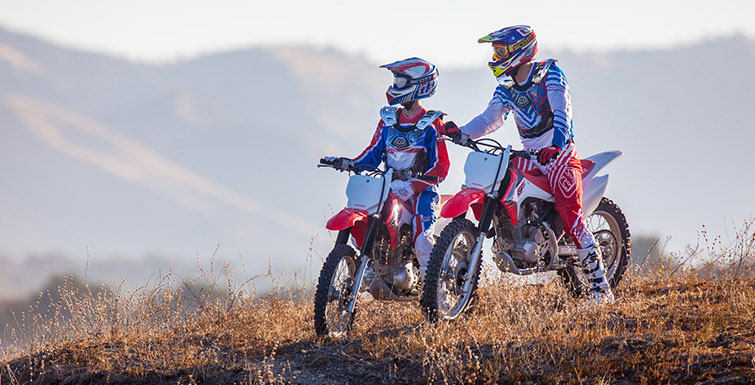 SEALED BATTERY: The maintenance-free sealed battery helps ensure that your CRF230F is ready to go without a lot of pre-ride preparation. MOTOCROSS-STYLE SEAT: The motocross-style seat is low and comfortable, allowing for maximum rider movement. RIGID BODYWORK: Bold CRF graphics and bodywork that is rigid and stylish out on the trail. KEYED IGNITION: A keyed ignition switch for added security—the switch lets you control who goes riding and when, important if you have younger riders in the house. ELECTRIC STARTER: Push-button starting makes getting going easier in all kinds of conditions, while the efficient design adds minimal weight. LIGHTWEIGHT RIMS: Strong, lightweight rims feature straight-pull spokes for more strength. DISC BRAKE: The front disc brake provides superior stopping power, and the front disc rotor is drilled for lightness and better wet-weather performance. 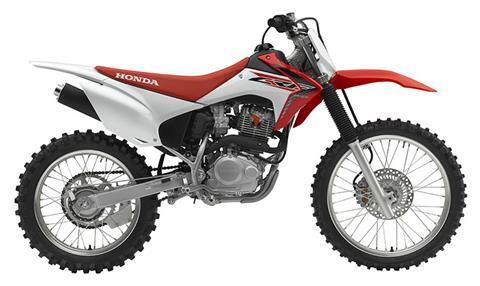 223 CC ENGINE: A dependable 223 cc single-cylinder air-cooled four-stroke engine offers plenty of user-friendly power and torque spread over a wide rpm range. SKID PLATE: A high-impact plastic skid plate protects lower engine cases. HEAVY-DUTY CLUTCH: The heavy-duty clutch offers smooth, progressive engagement. PRO-LINK REAR SUSPENSION: Progressive linkage connects a single heavy-duty Showa® shock to the swingarm, delivering an excellent combination of spring and damping rates over a wide range of riding conditions. SNAIL-TYPE CHAIN ADJUSTERS: Our CRF230F includes snail-type chain adjusters for easy maintenance. CRF230F ARE INTENDED FOR OFF-ROAD OPERATION ONLY. ALWAYS WEAR A HELMET, EYE PROTECTION, AND PROTECTIVE CLOTHING, AND PLEASE RESPECT THE ENVIRONMENT. OBEY THE LAW AND READ THE OWNER'S MANUAL THOROUGHLY. Always stay on established trails in approved riding areas. CRF is a registered trademark of Honda Motor Co., Ltd.